Sea serpents have a longer and grander history than just about any other cryptid. They were studied and debated about for hundreds of years before the formal discipline of cryptozoology arose. During this time period, dozens of other mythical sea creatures were proven real, and at many points in history it seemed as if official discovery of the sea serpent was just around the corner. 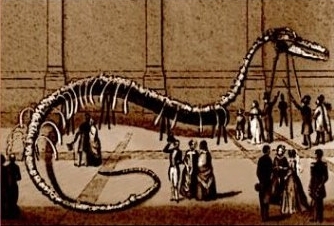 However, no official discovery ever happened and eventually the sea serpent became a subject of ridicule, one that almost no scientist would touch. Sightings of sea serpents are quite numerous, occur in all the world's oceans and come from every era of history, including a substantial number of modern sightings. Because of these facts, and because the ocean is by far the easiest place for a large animal to live undetected, many researchers still hold out hope that someday the sea serpent may be discovered. 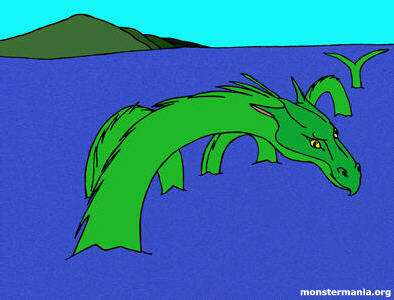 Among mainstream scientists, however, there is no longer any serious belief in the sea serpent. It remained mythical for too long, and therefore it quickly brings ridicule to any scientist who investigates it as a possibly real flesh-and-blood creature. Sea serpents descriptions have a number of things in common, but also enough variety that it sounds like more than one species. Sea serpents come in a variety of colors, including black, brown, gray and green, and have adult lengths ranging from twenty feet to hundreds of feet. Most of them are reported to move in an undulating up-and-down motion, with a series of humps visible above the water at times. They generally have a split tail, like a whale, and may have one, two or more pairs of paddle-legs along their lengths. They may have armored segments like a millipede, large plates or scales, or a smooth rubbery skin. Most often, they have smooth skin suggestive of a mammal. Sometimes sea serpents have a mane of hair or hair-like fins running in a row along the back. The head is generally described as horse-shaped, with huge cat-like or eagle-like eyes. On sea serpents that don't follow that body plan, the head and neck instead resemble an elephant's trunk, with tiny eyes and a small mouth near the "tip" of the "trunk." Some sea serpents sport whiskers, but it is not always clear whether witnesses mean the same kind of whiskers that cats, dogs and seals have, or whether they mean fleshy "whiskers" of the sort that are found on catfish. The creatures described in these reports tend to look fairly serpentine, as far as their overall body shape goes, although in some cases it is only the head end and tail end that look serpentine, with a roundish body between the two ends. At first, this generally serpentine shape meant that sea serpents were universally thought to be huge ocean-going snakes or sea dragons. Witnesses would confidently label them as snakes even when some features inconsistent with this conclusion were also noted, such as a mane of hair (typical of mammals only) or an up-and-down motion (all known snakes swim with a side-to-side motion). Later, as the discipline of cryptozoology began its first baby steps, people thought sea serpents were plesiosaurs (ancient aquatic reptiles that lived alongside dinosaurs), giant long-necked seals, or giant eels. Today, the most popular explanation is that sea serpents are really zeuglodons, a presumably extinct type of primitive whale that did not resemble today's whales in the slightest. A few "sea serpent" reports deviate farther from the norm and the creatures from these reports are generally classified as very different kinds of animal than the "classic" sea serpent. These reports describe animals that sound much like giant crocodiles or long-necked giant turtles or even giant invertebrates such as the con rit. Just as is the case with their close cousins lake monsters, many local names have developed for regional varieties of sea serpent, and these are often used as if they are proper names for one animal even though they are actually applied to a small population of such creatures. For example, "Caddy" is the name for the type of sea serpent that is reported from coastal waters near the northwestern part of the North American continent (mainly Oregon, Washington and British Columbia) and "Morgawr" is the name given to the monster of Falmouth Bay, a British sea serpent. Dinsdale, Tim. The Leviathans. London: Futura Publications, 1976. Heuvelmans, Bernard. In the Wake of the Sea Serpents. New York: Hill and Wang, 1968. Juliano, Dave. Sea Serpents and Lake Monsters: Legends and Myths, or Reality? Reinstedt, Randall A. Mysterious Sea Monsters of California's Central Coast. Soule, Gardner. Mystery Monsters of the Deep. Sweeny, James B. A Pictoral History of Sea Monsters and Other Dangerous Marine Life. New York: Crown Publishers, 1972.